Two more of Valve's Infected have been turned into cute little plushies. You may have been able to fight off Valve's official Left 4 Dead 2 Boomer plushie over the past few months, but now he's got friends. 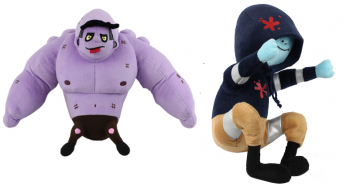 Valve has put the second and third in its line of Left 4 Dead 2 plushies up for pre-order on the Valve Store. This round of plushies includes the Hunter and the Tank. They're both a little bit cheaper than the Boomer plushie was at its release, down from $49.99 to $29.95 and $34.95 respectively, and if you pre-order one before December 27, 2010 you get a 10% discount. These new plushies at least won't vomit on you this time, but they still emit 10 different sounds when plugged up with 3 AAA batteries. However, while you're busy hugging the Tank and his cute widdle legs, the Hunter will likely rush up from behind and claw your intestines out, after which the Tank will punch you across the room. It's just in their nature. The Boomer plush was 13 inches tall and 13 inches wide, and these plushies are comparable at 13 inches tall for the Tank and 10 inches tall for the Hunter. The Tank is a little scuffed up and the Hunter even has cute bloodstains on his hooded sweatshirt. Valve teased that the first Left 4 Dead 2 plushie line would include 5 in total, meaning it still has two more to reveal in the future.